After the exams are over, who do you think is more relieved? The teacher or the student? Can hear all the Moms out there - the mother! The past few days have been quite busy as my son had his mid-term exams and they finally ended yesterday. Whew! And to think he is just in 4th grade and goes to one of those schools which don't have the concept of a test every Monday... that would be so sad and compound the Sunday evening blues for both him and me...thank God for small mercies! The pre-exam days and days of the exams are days when I need to set my alarm to go off half-an-hour earlier than my usual time...when the student is blissfully snoring away tucked cozily in his blanket. Don't you think its funny the way mothers try to cozy and huddle the sleepy angelic looking little ones in their beds when you have only 10 minutes more to get them out of there? Lest you think I am one of those mothers who spend hours everyday helping kids with their studies, I am not! The only reason I get up earlier and rush through my chores is so that I can sit with my son for his exam prep for an hour and still mange to get on with the rest of my routine, i.e, workout, cooking, office, bake and blog. If you are a mother, then you know its nothing short of a Herculean task to get the kids to sit down for studies and actually get them to concentrate. How I wish my son would like me (and most other kids of our times, we are now ancient aren't we?) study on his own and I just had to supply him some thing to snack on.. sigh! Like my Mom would when we were preparing for the exams. My childhood best friend and immediate neighbor would come over to my place for 'combined studies' and it was a huge plus for us. Guess why? Girl talk was one thing, Aunty, the friend's mother would also pitch in to send us, the hard-working students some yummy eats!! Now I won't tell you, though I was a 'serious and tense' good student who would study for hours, the 'exam tension' could not stop me from keeping my ears strained for my mother or Aunty to give a shout for something to eat. Such welc..uummm breaks! 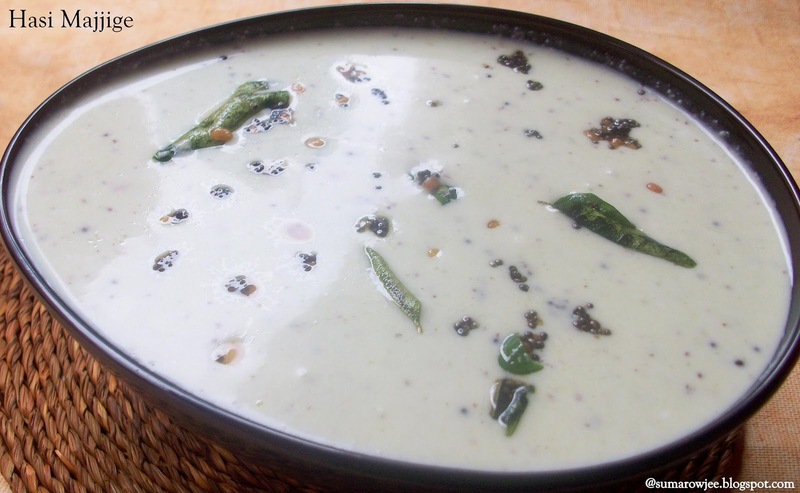 Procedure: Grind the fresh coconut, mustard seeds, asafetida, chillies, Bengal gram and coriander to a smooth paste using very little water. Take the yogurt in a bowl. Add the ground paste, salt to taste and whisk till well combined. Add about 1/2 cup water to thin it. Do not thin it down too much or the flavor will be lost. Heat the oil for the tempering. Add the mustard seeds. When it sputters, add the urad dal, saute till it turns a golden color. Add the curry leaves, hing, saute for a few seconds. Pour this over the yogurt gravy, mix. Serve with hot rice. 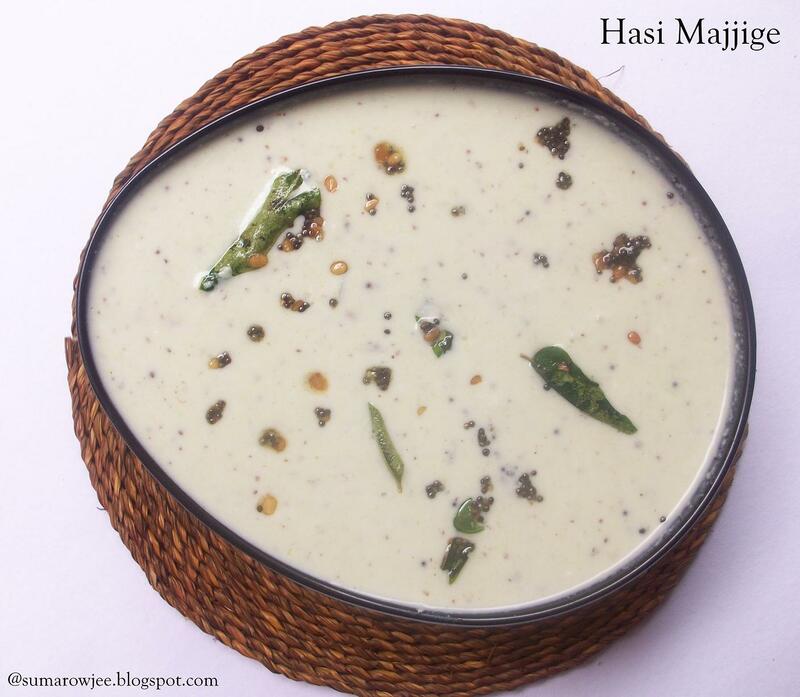 This is a preferred accompaniment to Matodi Palya. The consistency of the gravy is meant to be neither thick nor very thin. 1 teaspoon Bengal gram works fine for this proportion, add another teaspoon if you prefer more thickness. Keep the gravy refrigerated or it will turn sour. Hard Rock Cafe - Opened first in London, England, started by two music loving people, Isaac Tigrett and Peter Morton. History has it, Eric Clapton, the famous English guitarist, loved to eat at this then small American diner called Hard Rock Cafe. Clapton was a regular here and became friends with the proprietors and asked them if they could save a regular table for him and put up a plaque sort of thing for his table. The proprietors laughed and asked him if they could put up his guitar on the wall and he handed it over to them, it was put up on the wall. In a weeks time, another guitar arrived from Peter Townshend, the famous English guitarist, this was slapped on the wall as well. What started with one guitar on the wall now is 70,000 guitars, drums, pianos, scarves, jackets, handwritten lyrics and lots of other rock memorabilia, in fact, the largest collection of its kind in the world. 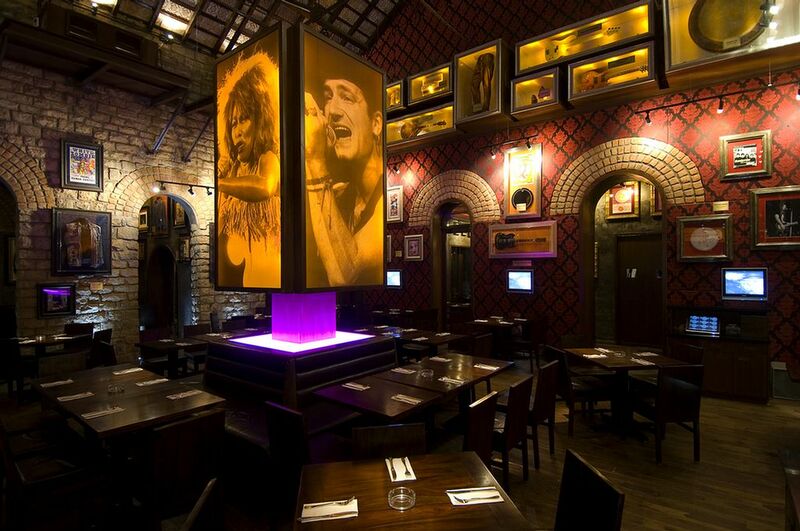 Hard Rock Cafe now has over 173 venues across 52 countries in the world. A place for good music and great times, with American fare served here, this place believes in 'Love All, Serve All'' philosophy, welcoming everyone regardless of class or creed. HRC Bangalore, is on St.Marks Road, opposite the LIC building. You can't miss the retro feel of the place as you enter it, housed in an old building on the busy road, valet parking is available, thankfully! The cafe consists of a 100 seat restaurant, a bar and the signature retail rock shop. HRC with Avian Media had called a few food bloggers including Geetha, Ally, Madhuri and me for a sampling of their Mexican menu as part of the Mexican Fiesta which was on till 20th of this month. My sincere apologies to Avain media for being unable to put up this review earlier. The first thing that you notice about the place is its remarkably different ambiance, with its very high ceilings, the rock memorabilia on the walls. If you are a hard rock lover, you would love to soak in this and take a leisurely walk through the cafe, browse the collection and take your time over the meal with your favorite numbers played by the live band. Since we were there at lunch time, the music was very noticeably low, very much unlike a rock cafe. The music goes up a few decibels only during the happy hours and in the evenings, we were told. Mexican food is synonymous to spicy and tongue tickling fare and having it in a place as well known as the HRC was indeed very enticing. Since most of us were vegetarians and we wanted to taste all the vegetarian dishes on the menu, we requested for a serving of each of the dishes. The Chef obliged and made vegetarian versions of the non-vegetarian dishes as well. Geeta and Madhuri ordered their cocktails, while I asked for a Virgin Pina Colada. It was really refreshing and delicious, but I could get no further beyond the first few sips when our food started to arrive. The first to arrive was Spicy American Corn and Danish Mozarella Samosette which was extremely delicious, with the burst of melting cheese encased in crispy Pyhllo. Yummm!! I loved eating this as is and chose to taste the fresh roasted tomato salsa separetely. The pesto mayonnaise was a true creamy, creamy delight and we could not get enough of the samosette and the dip, requested for another serving. We had a vegetarian version of the Seasoned Chicken and Corn Tacos, with cottage cheese in place of the chicken. 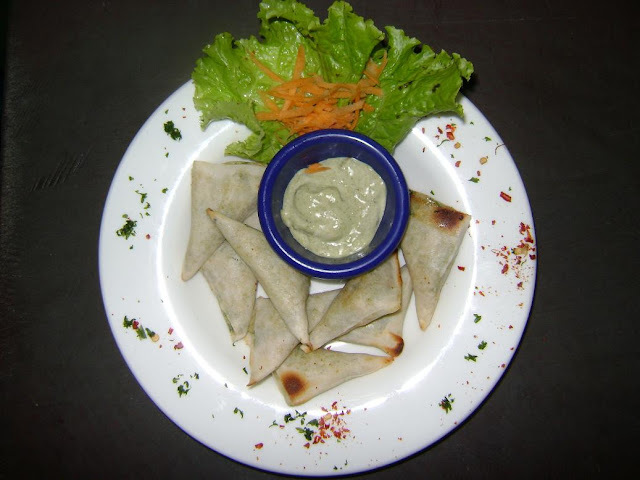 Crisp taco shells filled with a spicy mix of cottage cheese, lettuce, tomatoes,olives and spring onion , served with homemade guacamole and sourcream. The tacos were good, though I must say the guacamole did not impress. We also tasted the Tostadas topped with cottage cheese, caramelized onions, roasted sweet red peppers, topped with cheddar cheese and jalapenos. Since the portions are huge, our tummies were already groaning under the wight of all the food and drink. 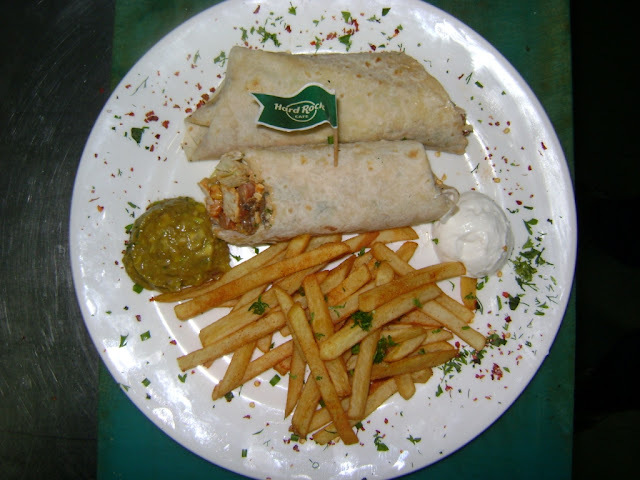 Then came the Albequerque Cottage cheese & Veg Burrito which are tortillas laced with chilli garlic mayo, topped with tomato rice, cottage cheese and assorted vegetables. Served alongside fries, guacamole and sour cream. Very, very, very substantial to say the least!! We were still left with the famous burgers of HRC and we could seriously eat NO MORE! We had tiny portions of the vegetarian burger, which again came with Cajun fries and guacamole. The burger was good, but given that we were stuffed completely, we could do no justice to it. A stuffed stomach still and always has room for dessert. The only dessert on the Mexican menu was Black and White, chocolate pyramids with roasted cinnamon, served with vanilla ice cream and a drizzle of chipotle sauce. I am not much of a chilli in my desserts person, so I can' really say I enjoyed the dessert with the spicy sauce. But it was a huge disappointment to not have choice for dessert as I was really really looking forward to this part of the meal with more authentic Mexican desserts. My opinion: Non-vegetarians will have a ball at this cafe, but the vegetarain versions on the Mexican menu could certainly do with more than cottage cheese in most dishes. And less ice in the drinks would be a suggestion as my Virgin Pina Colada which was really refreshing the few sips, was nothing much than sweetish cold water by the time we were half way through the meal. Food presentation and plating definitely can do with a lot more attention. The regular menu has better options for the vegetarians - of them Nachos, salads, onion rings, white cheddar smashed potatoes, burgers and of course the desserts! More information on their site here. Vegetarian, love hard rock and fine with limited food options? You must then surely go, more for the ambience than the food. Not a hard rock person and vegetarian? This is not the place for you. Non-vegetarian, love your cocktails and crazy about rock?? You must surely go! Thanks HRC and Avain Media for having us over. A special note of thanks to Chef Vikas Pathak for accommodating our request for veggie versions and dishing up the Mexican fare for us. We will not forget the samosette in a hurry! 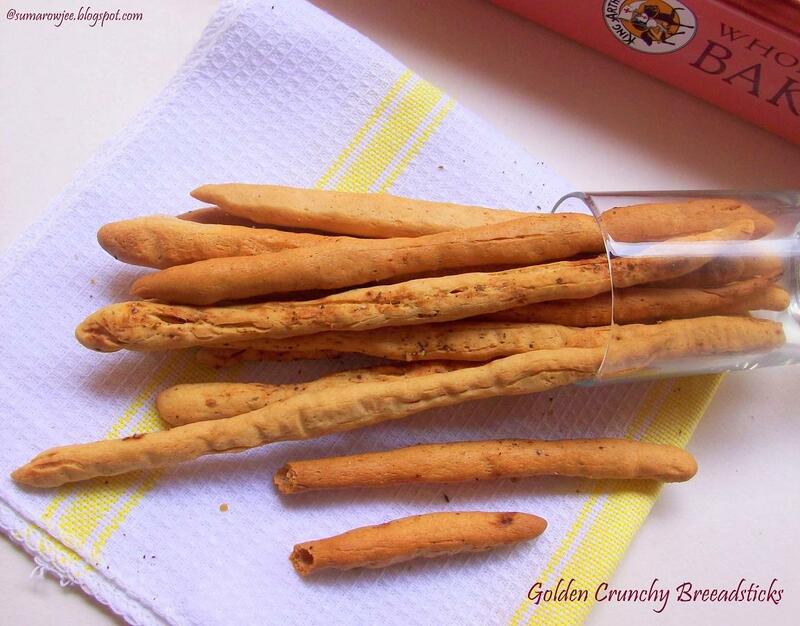 Golden Crunchy Breadsticks - With Pre-ferment - Yaay!! Small things which make us feel so happy! In our fast paced lives filled with bigger priorities, so many necessary but mundane things, these small pleasures are such saviors! Things that make you look forward to that time of the day when you can do what really excites you. That 'me' time doing what you really, really enjoy - not doing something which you ought to do. Reading my recently acquired King Arthur Flour Whole Grain Baking book for instance - I never thought I will get so hooked to it! Interesting recipes, tips and information, am so glad kid brother gifted it to me! Well, he wanted to gift me something, I chose this book. He rolled his eyes...but no better gift which I will treasure..
Another confession here - come to think of it, with so many confessions here, should I rename my blog as 'The Confessions Of A Wannabe Baker?' Tell me!! For all my interest in baking, am not much of a knowledge-seeking, learn- the-science-behind-baking kind of person. I enjoy baking tremendously, to the extent of being obsessed with it and I do manage to read up a wee bit (just a wee bit) when I have to. Given the kind of person I am, I am surprisingly enjoying reading up even these bits in the book. I have tried out a couple of recipes, Graham Crackers, No Knead 100% Whole Wheat Bread and there are many many more I just can't wait to try! Honestly, when I ordered it, the book did not sound all that interesting to me, whole grains and all, but I went ahead as I wanted to bake healthier too. But again, surprise, I really like this book, its a winner!! I recently baked these bread-sticks which go by the name Golden Sesame Breadsticks from the same book and loved them! Made with more of whole wheat and some APF, they turned out crunchy and tasty. I have been meaning to bake with pre-ferment since quite some time this seemed to be an easy one. I am so excited and must tell you about this way of baking with yeast which is new to me. Pre-ferment refers to part of the liquid, flour, cool water and a pinch of instant yeast mixed together and allowed to ferment for 12-14 hours. The pre-ferment is then mixed with the rest of the ingredients and you carry on with the recipe. Well, I had earlier thought, warm water and sugar are absolutely essential to bake with yeast, but no, not in the case of instant yeast. The sugar in the flour is enough for the yeast (in instant yeast) to grow. Using cool water, allowing slow fermentation, helps get better flavor in your bread. That's an added advantage of using instant yeast. Patience not being one of my virtues, I have halved the below recipe and weighed the ingredients as it would otherwise take a lot of batches to bake the entire quantity in my small oven. If you have a big oven, please do bake the entire quantity. I have described the procedure to my understanding from the book. Take a bowl which will be large enough to mix the entire dough in. In this bowl, mix the whole wheat flour, water and a pinch of yeast. Stir to blend and cover with a plastic wrap. I have used a tablespoon of water more as the dough was too stiff (for half the quantity above). This will be a bit sticky, not watery though. This dough needs to be set aside at cool room temperature (that is, not in a warm place) for 12-14 hours. So you could ideally mix the previous day evening say around 6 p m. Rest it till 8 a m next day. This is so that you can finish the entire process, take pictures in daylight before your kids come back from school and descend on them ;-) The dough will be puffy but not be as bubbly as a white flour poolish, says the recipe. To make the dough: Add the flours, yeast, salt, water, olive oil and any seasoning you may want to the pre-ferment in the bowl. Here I have added the water gradually and used 1 tablespoon less. I did not want the dough sticky as the recipe does not specify this as a requirement. Knead the dough till it is smooth and very soft. I have kneaded for about 14 minutes, my dough was soft but not very much so. Place the dough in a greased bowl, cover with a clean kitchen towel and let rise till it becomes puffy. Mine took about 40 minutes and was almost double. Remember, it may take about 1 - 1 1/2 hours to become puffy, but not necessarily double. Shaping the bread sticks : Line your baking tray with parchment, grease lightly. Lightly grease your counter top with oil, place the dough on it. I have divided the dough into half and refrigerated the other half. I have made very small balls out of the dough and rolled them into 'snakes'. Verbatim from the book -You could also roll the dough into a rectangle 10 x 20 (if using the large baking sheets). Cut the rectangle lengthwise into two 5 x 20 inch strips. Sprinkle the seasoning on the dough, roll lightly to press in the seeds. Use a pizza cutter or sharp knife to cut the dough(the short way) into 1/2 inch x 5 inch strips. Twist the ends of strips in opposite directions (as you may wring a towel) to make a spiral, and place them on the baking sheets. The soft dough will stretch as you work with them, hence you are to begin with 5'' wide strip of dough. You would have to do the above mentioned procedure for even shaped, pretty bread sticks. If you are OK with less pretty, uneven ones like me, just divide the dough into balls and roll them. Cover the bread sticks and let them rest for an hour. They will not rise much, but this rest makes them much lighter. Towards the end of the rise period, pre-heat oven to 180 degrees C / 350 degree F. Bake them for about 25 minutes or till light golden. 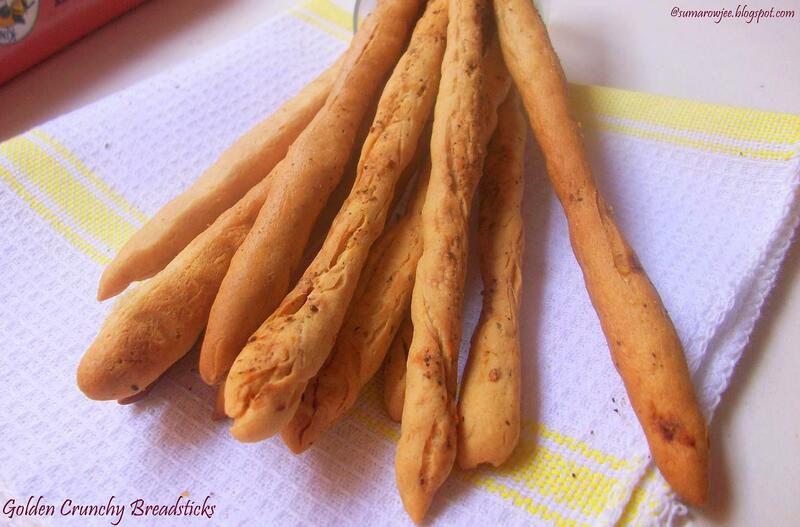 The baking time depends on how thin or thick your bread sticks are. So watch out. I baked for about 35 minutes. 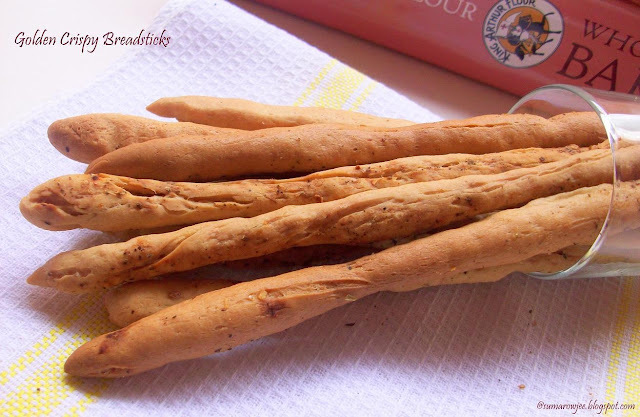 They will brown quickly towards the end, so if you decide that they need to color a little bit more, hang around the kitchen and clean up the place, but don't go away, your bread sticks may brown a bit too much and taste...uhhh.. a little too much baked...I did that for one batch!! Remove from the oven, cool on rack. Cool completely and store in an airtight container. Half a scant pinch of yeast? A pinch of yeast is what comes between you thumb and forefinger, I have used half of this for the pre-ferment as I have halved the recipe. I have taken out the refrigerated dough once my first half batch just went into the oven and then rolled them. Rest for an hour and bake. If you have added enough seasoning and spice, you could eat them as is. If not, eat them with dipping oil or any other dip. These bread sticks are being YeastSpotted. Is this beginning to sound familiar to you? I came to know of this very recently, as in a couple of days ago, when Deeba nominated me for this project. Boy!! I must say I am so happy about this and also flattered (blush, blush, blush!!!). Thanks a ton Deeba, that was really very sweet of you! If Project 7 Links is new to you, allow me to tell you a bit about this. This project is the brain-child of Katie @ Tripbase, the idea behind it her own words is to 'To unite bloggers (from all sectors) in a joint endeavor to share lessons learned and create a bank of long but not forgotten blog posts that deserve to see the light of day again'. Each of the nominated bloggers need to nominate up to 5 bloggers and this goes on. The Isn't this such a fabulous idea? As bloggers, we all have our favorite posts, the one we think is most beautiful, the post your readers find really useful. And not to forget those posts or a post which we sigh about, as it was good, but due to some reason did not get the attention it should have got. Maybe we posted this on a weekend or on a holiday? ( The days I think get less people to your blog, well at least mine!). Would you not like to get all nostalgic about your virtual child and share a few of your favorite posts, highlight them again to your readers? Oh yes, I certainly would!! Or perhaps, see them in a different light now? And I would also like to say a few things about each of my posts below, bear with me, but I can't resist this. Since this is going to be an unique and lengthy post, I thought this deserves to be a post on its own...The blog is very blogger's pride and such an important part of us, and most of us are obsessed with it... go on admit it!! Close on the heels of this cake would be the Coffee Cream Cake I baked for my birthday, this has my favorite coffee cream layered with my favorite fat less sponge, Deeba's recipe. A winner of a recipe for me always! My Most Popular Post : This, without doubt, is the Baking Supplies & Ingredients In Bangalore post which comes with Google maps. When I started to bake, my biggest challenge was to find baking ingredients and sources in the city. Back then, I was unaware of blogs and had very limited access to the internet (no system or internet connection at home and my son was a baby then) It was with difficulty and with help from the local bakeries and a bit of exploring the city, I found some places where you could buy baking supplies. This was one of my very first posts on this blog. I wrote it as I thought it might help anybody searching for supplies here. Little did I know that this would go on to be the most read post on my blog and so many people would find this useful. Its also become as sort of interaction space for baking enthusiasts in the city. There are192 comments for this post including my responses. I try to update this post as and when I find new information and try to respond to queries as much as possible. Well, for one, I had an extremely disastrous beginning with yeast. Apart form my lack of knowledge and experience, little did I realize that the yeast we get here was the major culprit. Well, if you have not seen or worked with good yeast, how do you recognize bad yeast? It took me SO many hair tearing experiments, to figure out that yeast was the problem and the BIG one. Then came Gloripan instant yeast and it was so much easier. Whew!! I sincerely am not someone who creates recipes, I just follow good recipes. So with my teacher's guidance, I baked Chocolate Chip Bread with half whole wheat and half APF. Was I so proud it worked so well and produced a beautiful loaf! I baked this twice ( I bake twice a number of times) before I put this on my blog... just to be sure..
Apart from, Baking Supplies & Ingredients In Bangalore , the recipe for Home Made Piping Gel is among the most read, gets me visitors, so hopefully useful also. Since we do not get piping gel here in Bangalore and I wanted this to decorate my kids' birthday cakes, I had tried out this recipe long back and it had worked well for me so went on the blog. You can draw cartoon characters etc on fondant with it, as I have done here for the Kiddie Helicopter Cake. Don't go by my clumsy hand, you can do pretty stuff with it ! I had not anticipated ( definitely not when I blogged about this when I had just begun) that this would continue to get me visitors long after also. If you like decorating cakes for kids, give this a try...I have not made this in a while, will make this again and try to give more details in the post. 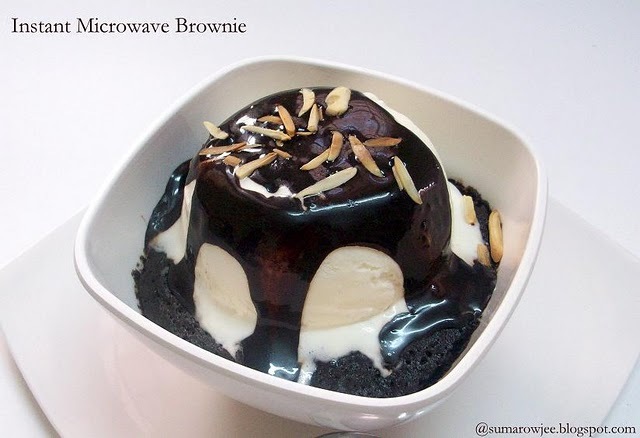 Surprise Success Post : Instant Microwave Brownie - In Just 2 Minutes!! 2 minutes to cook. A warm very chocolaty brownie for that insane dessert craving when you or your kids want a chocolate dessert instantly! I don't know of a quicker and better way to satisfy a chocolate craving. This one is a simple chocolate dessert and a no-bake one at that alright, but still gets people to my blog. Most controversial post - none so far, none hopefully in future!! Post Which Deserves Attention, But Did Not Get As Much : Orange Biscotti - And A Mail To God! To read more about 7 Links, check Katie' link here. Thanks Katie for this wonderful idea, you just got all of us nostalgic and proud of our virtual spaces. Thanks again Deeba, for giving me a chance to bring out this blast from the past..
Ganache (pronounced as ga-nash) is a French term meaning a smooth mixture of chocolate and cream. It is basically hot cream poured on chopped chocolate, allowing it to melt, then stirred till smooth. Additionally, butter or oil, honey or corn syrup and flavorings are added to the mixture. The emulsion is cooled to various degrees according to the preferred end consistency of the ganache. The result is a glossy, smooth, uber delicious and creamy emulsion you could eat as is and if have any left over, use to frost your cake. This is a fabulous cake frosting if you have just begun baking, guaranteed to please most palates, making it a great confidence booster for a beginner. Its quite easy to prepare if you can lay your hands on good chocolate, some good cream and remember some basic rules, dos and don't 's while making this. You can't really go wrong with this unless you burn the cream or add cold flavoring to the ganache. Here is some information for you, which I have majorly collected from Baking 911 and Joy Of Baking. And a couple of bits from what I have learnt (from my mistakes! ), do correct me if I am wrong. Chocolate : The chocolate here can be bittersweet or dark chocolate if you prefer a slightly bitter and less sweet frosting, milk chocolate for a sweeter frosting and white chocolate, well, if you like the taste of it. The taste depends on the quality of chocolate you use. Valrhona, Dove, Lindt and the kind are the preferred high end brands. I personally like ganache made with dark chocolate and use a brand called Morde (not high end by any stretch of imagination!) which is quite good. If you by any chance store the chocolate in the freezer or fridge, get it out, let come to room temperature, chop quite fine before using. Cream : Whipping cream or heavy cream with a high butter fat content of 35-40% is supposed to be the best for a good, stable ganache. The only cream we get here is a low fat one with 25% butter fat, so its Amul Fresh cream for us. It works well, so am a happy user of the brand. I personally have not used the local fresh cream available at the supermarket, so can't really say how it will work. Sour cream or crème fraîche can also be used in place of cream. I have also used whipping cream (like Rich's) for making ganache a couple of times in an emergency, but it makes sweet ganache. Proportion of cream to Chocolate : The proportion of cream and chocolate can vary according to personal preference and also the use for which the ganache is intended for. Equal weights of chocolate and cream is the preferred proportion. More of chocolate will give you firm ganache, less chocolate will give you a softer one. I use 1 1/4 cup of chocolate for one cup of cream, have never checked how much it weighs though. I use about 1 tablespoon of soft unsalted butter for this proportion. Do experiment with the proportions to figure out what you will like better. I prefer to use butter and not honey or corn syrup for the extra shine as using these will make the ganache sweeter. Flavorings can be liqueur, extracts, coffee, citrus zest etc. You could also use spices like cinnamon, herbs like lavender etc to infuse into the cream when you heat. Strain it, re-heat if needed and continue with the process. You could add almond meal to ganache for nutty taste and some texture. Getting Ready : Keep any refrigerated flavoring such as essence out of the fridge before you begin. This is to ensure it comes to room temperature when you add it to the ganache. This is very very important. In case you forget to do so, you are better off not adding cold flavoring lest you end up with a hard lump of chocolaty mass instead of good ganache. You will need : A heavy bottomed saucepan, cream, chocolate, unsalted butter, a good heat-resistant spatula, a clean and dry bowl with a fine strainer suspended over it, cling film to cover the bowl as it cools. And of course any extract at room temperature if adding. Cut the chocolate into pieces, very small ones preferably. If the pieces are small they will melt faster and better, reducing the need to break them down or stir too much to smoothen the ganache, thereby reducing the air bubbles. Procedure: On low heat, in a heavy bottomed saucepan bring the cream and butter to a boil. You will see bubbles here and there. Take care not to burn the cream. Pour it on the chocolate, stir slowly. 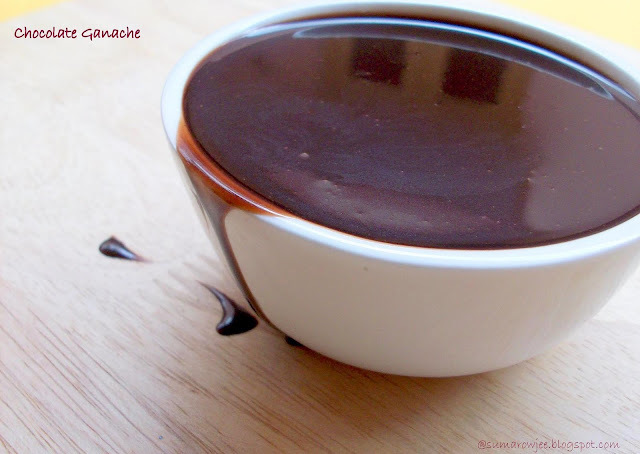 If u stir vigorously, this creates air bubbles, making the ganache grainy. Let sit for 3-4 minutes or until the chocolate melts completely. Use a spatula to stir briefly to combine. Add extracts if using. It will be quite fluid at this stage and will continue to thicken as it stands. Wrap the bowl with cling film and allow to cool. Use as needed. Grainy ganache: If you whisk too much, your ganache may turn out grainy. If this happens, no catastrophe, strain it with a fine metal strainer ( as fine as a tea-strainer). If there still continue to be bubbles, strain multiple times till you get a smooth ganache.. at least a much smoother one! I have managed a fairly smooth ganache, but not an absolutely smooth one so far, sigh! Lumpy (kick-myself) ganache: If you mess up with the temperature of the ingredients and have a lumpy mass on your hand, then you may try to salvage it by heating in the microwave or a double boiler ( can't really say, but you may be lucky!) and use it as a topping for your kids' ice-cream. Chocolate is chocolate and delicious even if its dull and dreary, it still sells with them and us! Curdling: God forbid (forgive the exaggeration, but this is a serious matter for us), if your ganache curdles, gently stir in a couple of tablespoons of hot cream (if you happen to have that extra pack of cream) , keeping your whisk or spatula submerged. Then strain, pray for it to work. Storing: Ganache made with only heavy cream and chocolate (with no added butter and the rest of the things) can be stored at room temp for 2 days, in the refrigerator for a week and frozen for 3 months. If you have added butter, its better to refrigerate the ganache. I find it very handy to have ganache in the freezer for use as cake frosting or as dessert topping . Frozen ganache can be microwaved on HIGH power for a minute or more to get it all gooey and liquid in no time. Wicked Ways With Ganache : You could use ganache to either pour, whip or pipe it for different kinds of decorative effect. Pouring ganache : If you want to pour ganache on a cake, first brush any crumbs off the cake. Pour as soon as it is just slightly warm but still pourable. If pouring ganache on a chilled dessert like a mousse, chill the mousse thoroughly so that the warm ganche does not melt your dessert. It will also set quickly. If you would be pouring the ganache on a cake, you could place the cake on a cooling rack with a tray underneath to catch the drip and pour the ganache. Then lift the cake carefully ( with heart in mouth) and place on the cake platter. I prefer to keep it on the serving platter, then pour the ganache in the center. Tilt the platter very very carefully to spread the ganache, no need to use a spatula. 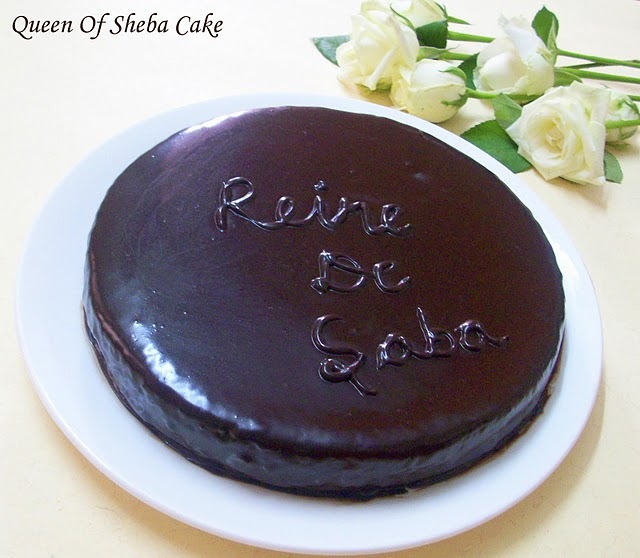 I did this for the Queen Of Sheba Cake cake below and was very pleased with the results. I read about this trick somewhere, not able to recall the source. Whipped ganache: This is ganache made airy, is lighter in color. Dreamy, I so want to try this!! Rose Beranbaum recommends (refer source) using 6 ounces / 168 grams of bittersweet chocolate and 360 ml / 1 1/2 cups /12 ounces of heavy cream. Cool to 65 to 68 °F/20°C. Temperature is important. Beat only until soft floppy peaks form when the beater is lifted. She says, when it starts thickening, it's safest to beat by hand. If you over whip, it becomes grainy. To whip or pipe ganache the ganache must be cool. Cool it at room temperature or place on a bowl of ice till its cool to the touch but not very cold. Do not whip when its too cold. 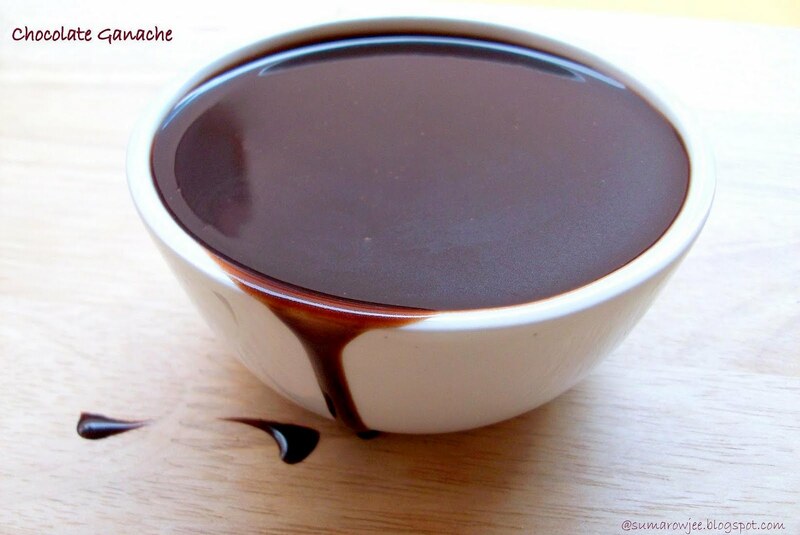 If the ganache gets very cold, keep it in a warm place in the kitchen to warm, do not reheat. 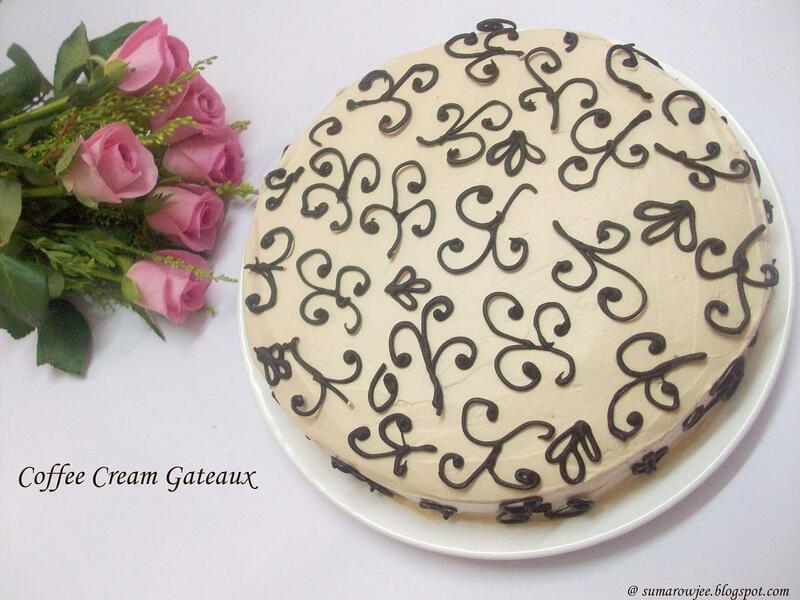 Whipped ganache looks fabulous when piped on a dark ganache frosted cake. Piping: To pipe, cool the ganache till thick enough to pipe. Leftover ganache : If you have any left over, you could make truffles or simply freeze for later use. To make truffles, refrigerate ganache till very firm. Scoop out small balls with a melon baller or spoon, then roll in cocoa. Keep refrigerated. Gulping about the calories here? Check out this recipe for Low Fat Milk Ganache, you can have your cake and eat it too! 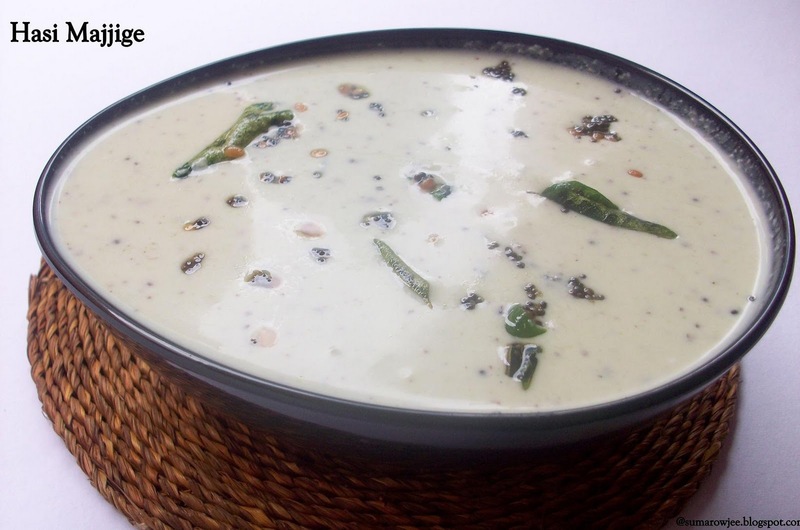 Iyengar bakeries in Karnataka are something you will find in almost every other street. You enter a typical Iyengar bakery and the serious but very respectable looking proprietor at the counter with 'South-Indian' written all over will greet you with a nod. He has photographs of God adorned with flowers and a lamp lit near him. Close by hanging on the wall is a paper which displays the list of other non- bakery 'items' they sell like puliogare powder, rasam powder, sambhar powder, bisibele bhat powder etc. You wait for your stuff and hover nosily for a couple of minutes (checking the piping designs, the finish ) and he will command in his authoritative 'owner' tone that 'Madam's' parcel is getting late, making sure we ladies specially do not have to wait for long for our packages. But he will not humor you if you want to buy err... some whipped cream or canned cherries or want to know where to buy baking things. The other next 'main' guy will be helpful here :)). This has been my experience when I have bought whipped cream for my first couple of frosted cakes and eventually gathered some info about baking supplies and sources in Bangalore.. Thanks to my neighborhood Iyengar bakeries! Sweet things popular here are butter cream laden cakes in a riot of colors, anarkali, dil - pasand (wonder how and why these were named so! 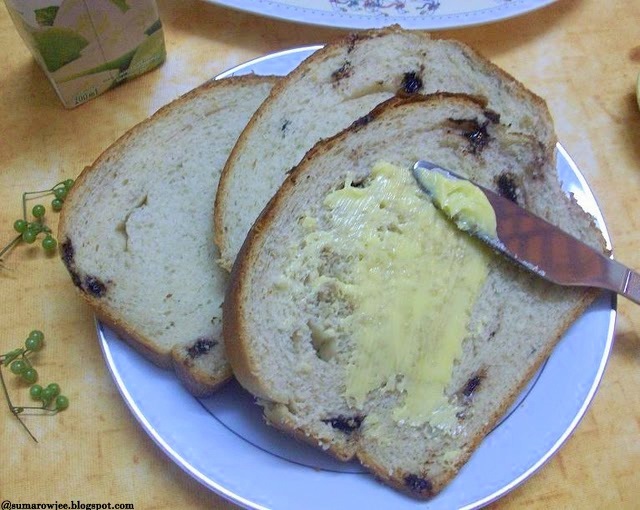 ), honey cake, benne biscuits, raagi biscuits, coconut biscuits, fruit bread, milk bread etc. Festival or not, neatly packed obbattus, kodbale etc line the counter. Come Christmas & New Year and you will find stacks of butter cream frosted cakes, spilling literally onto the pavement, in all colors and price ranges to please every prospective customer. Some of their most popular savory baked stuff include nippattu, potato buns, onion toasts, puffs (which are sometimes amusingly called as 'pups'! ), khara buns, khara biscuits or masala biscuits, bread sticks with ajwain, sev, spicy groundnuts and cashew, chips among the savory fare. Fresh loaves of bread with a wonderful golden crust which are sliced right before your eyes, making you marvel at the skill of the guy at the task. I prefer their savory stuff to the sweet, favs are khara buns, toast and congress kadale-kayi. Unbelievably, I have not eaten the khara biscuits in years, though I vaguely recall that they are like the benne biscuits in texture, very buttery and spicy. As I have said before, I don't love my food or sweets very buttery. 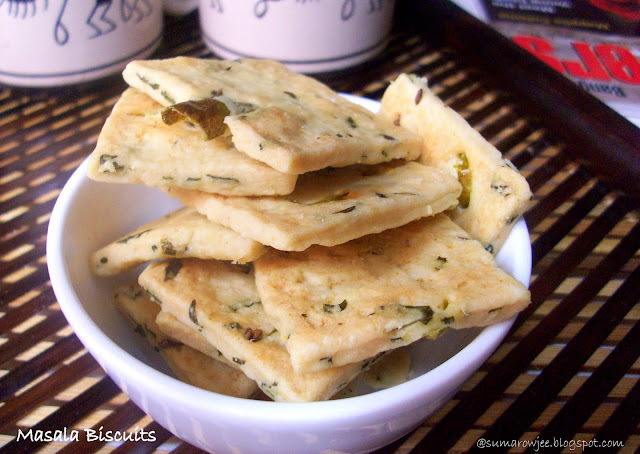 And when I came across this recipe for the very tempting looking Masala Biscuits on Divya's Easy Cooking, I very definitely wanted to try them out for a home-made less buttery yet tasty version. And I am glad I did! They turned out very tasty, quite flaky and light, making it dangerous to have them on hand!